When contacting A. Johnsen Industri A/S, you can always be certain that we have the competence to meet even the most complex challenges. In our moulding department we have more than 30 injection moulding machines covering sizes from 10 to 1000 ton clamping force and a shotweight from approximately 0,1 to 5000 gram. Most machinery is equipped with different peripheral devices such as ban conveyor, robots and peripherals for colouring. 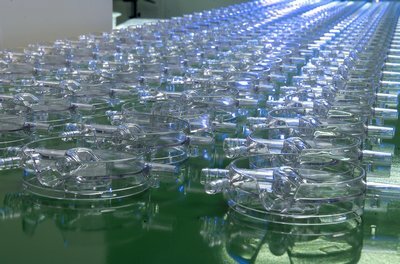 In our stat-of-art cleanroom, certified class 100.000, we have both production and pakaging for the medical industry. We also manufacture models in plastic and metal for optical and technical testing. We have an inhouse toolroom where we produce moulds and tools for our production. Over the years we have worked with professional toolmakers in Denmark, Europe and the far East. This is your guarantee that we are also able to meet your every need or challenge with fast delivery an a reasonable price.